"Brilliant detail at a low price"
This is a nice kit and at an extraordinary price. I&apos;m always impressed with Tamiya&apos;s ability to produce picture perfect molded parts at a reasonable cost. This kit is stereotypical of that. The part count is low a low and the build simple, but the detail is quite amazing and the finished result very rewarding. Includes three realistic figures - two infantrymen and a commander. Gun barrel elevates and depresses. Hatch is movable, opens or closes. Yes this is an ancient mold, but still a very nice kit. Maybe not as intricately detailed as much newer kits, but I enjoyed putting it together and painting and weathering it. Very little flash to deal with though the parting lines require work. The only problem I had was with the headlight protection framing. The design and instructions were vague and resulted in too short vertical members and I had to cut them off and cement new strip members. The fix worked out fine, but could have done without the aggravation. Again this is solid kit and shows that Tamiya has been doing it right for a very long time. "very good and an excellent price"
don&apos;t let the cheap price fool you because this is a good model and the finished product is well worth your time. the detail is amazing considering the price. I had no problems with parts fitting. it has 3 good figures that you can put with this kit or any dioramas you might have. I have no issues with this one and would recommend to all. 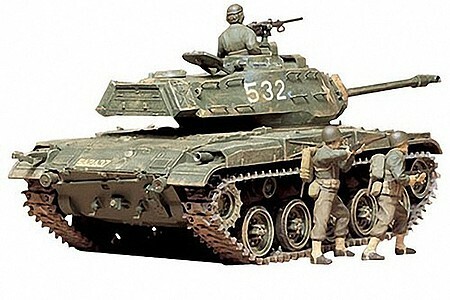 "A fun kit with great detail"
For the price, you can&apos;t beat this Tamiya kit. It may not have the detail that some look for that are used to building a fifty dollar kit, but that&apos;s okay because it gives you all the more options to be creative and give it your own personal touch. I found it a pleasure to build with no fit issues. Not bad on seam lines, injection mold or flash, so it gives the builder more confidence and creativity to enjoy the process and really make a stellar Tank. Highly Recommended.